Gideon Welles of Glastonbury, Conn. would rise in the political ranks to become Secretary of the Navy under presidents Abraham Lincoln and Andrew Johnson. His experience with marine operations was so limited that Lincoln once joked that when he, Lincoln, came to Washington, D.C. he at least knew the difference between the stern of a boat and its bow, which was more than could be said of Welles. Nevertheless, Welles, a lawyer and publisher, proved an efficient and effective Secretary of the Navy during the Civil War. His diaries have proved invaluable to Lincoln scholars in assessing the politics of the era. Welles, himself, was greatly moved by Lincoln's assassination. He felt that Lincoln's greatness was never adequately appreciated when the president was alive. Welles would attempt to right the matter in several books, including a biography of Lincoln. I had retired to bed about half past-ten on the evening of the 14th of April, and was just getting asleep when Mrs. Welles, my wife, said some one was at our door. Sitting up in bed, I heard a voice twice call to John, my son, whose sleeping-room was on the second floor directly over the front entrance. I arose at once and raised a window, when my messenger, James Smith, called to me that Mr. Lincoln, the President, had been shot, and said Secretary Seward and his son. Assistant Secretary Frederick Seward, were assassinated. James was much alarmed and excited. I told him his story was very incoherent and improbable, that he was associating men who were not together and liable to attack at the same time. "Where," I inquired, "was the President when shot?" James said he was at Ford's Theatre on 10th Street. "Well," said I, "Secretary Seward is an invalid in bed in his house yonder on 15th Street." James said he had been there, stopped in at the house to make inquiry before alarming me. especially so near the residence of Secretary Seward, where there were many soldiers as well as citizens already gathered. Entering the house, I found the lower hall and office full of persons, and among them most of the foreign legations, all anxiously inquiring what truth there was in the horrible rumors afloat. I replied that my object was to ascertain the facts. Proceeding through the hall to the stairs, I found one, and I think two, of the servants there holding the crowd in check. The servants were frightened and appeared relieved to see me. I hastily asked what truth there was in the story that an assassin or assassins had entered the house and assaulted the Secretary. They said it was true, and that Mr. Frederick was also badly injured. They wished me to go up, but no others. At the head of the first stairs I met the elder Mrs. Seward, who was scarcely able to speak but desired me to proceed up to Mr. Seward's room. I met Mrs. Frederick Seward on the third story, who, although in extreme distress, was, under the circumstances, exceedingly composed. I asked for the Secretary's room, which she pointed out, — the southwest room. As I entered, I met Miss Fanny Seward, with whom I exchanged a single word, and proceeded to the foot of the bed. Dr. Verdi and, I think, two others were there. The bed was saturated with blood. The Secretary was lying on his back, the upper part of his head covered by a cloth, which extended down over his eyes. His mouth was open, the lower jaw dropping down. I exchanged a few whispered words with Dr. V. Secretary Stanton, who came after but almost simultaneously with me, made inquiries in a louder tone till admonished by a word from one of the physicians. We almost immediately withdrew and went into the adjoining front room, where lay Frederick Seward. His eyes were open but he did not move them, nor a limb, nor did he speak. Doctor White, who was in attendance, told me he was unconscious and more dangerously injured than his father. he had placed his foot on the step. I was impatient. Stanton, as soon as he had seated himself, turned round, rose partly, and said the carriage was not his. I said that was no objection. He invited Meigs to go with us, and Judge Carter of the Supreme Court ^ mounted with the driver. At this moment Major Eckert rode up on horseback beside the carriage and protested vehemently against Stanton's going to 10th Street; said he had just come from there, that there were thousands of people of all sorts there, and he considered it very unsafe for the Secretary of War to expose himself. I replied that I knew not where he would be more safe, and that the duty of both of us was to attend the President immediately. Stanton concurred. Meigs called to some soldiers to go with us, and there was one on each side of the carriage. The streets were full of people. Not only the sidewalk but the carriage-way was to some extent occupied, all or nearly all hurrying towards 10th Street. When we entered that street we found it pretty closely packed. The President had been carried across the street from the theatre, to the house of a Mr. Peterson. We entered by ascending a flight of steps above the basement and passing through a long hall to the rear, where the President lay extended on a bed, breathing heavily. Several surgeons were present, at least six, I should think more. Among them I was glad to observe Dr. Hall, who, however, soon left. I inquired of Dr. H., as I entered, the true condition of the President. He replied the President was dead to all intents, although he might live three hours or perhaps longer. The giant sufferer lay extended diagonally across the bed, which was not long enough for him. He had been stripped of his clothes. His large arms, which were occasionally exposed, were of a size which one would scarce have expected from his spare appearance. His slow, full respiration lifted the clothes with each breath that he took. His features were calm and striking. I had never seen them appear to better advantage than for the first hour, perhaps, that I was there. After that, his right eye began to swell and that part of his face became discolored. Senator Sumner was there, I think, when I entered. If not he came in soon after, as did Speaker Colfax, Mr. Secretary McCulloch, and the other members of the Cabinet, with the exception of Mr. Seward. A double guard was stationed at the door and on the sidewalk, to repress the crowd, which was of course highly excited and anxious. The room was small and overcrowded. The surgeons and members of the Cabinet were as many as should have been in the room, but there were many more, and the hall and other rooms in the front or main house were full. One of these rooms was occupied by Mrs. Lincoln and her attendants, with Miss Harris. Mrs. Dixon and Mrs. Kinney came to her about twelve o'clock. 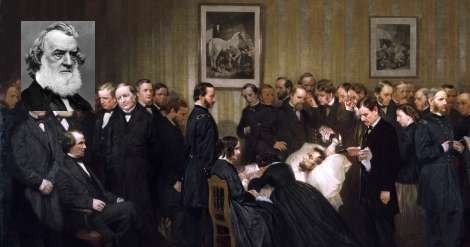 About once an hour Mrs. Lincoln would repair to the bedside of her dying husband and with lamentation and tears remain until overcome by emotion. [April 15.] A door which opened upon a porch or gallery, and also the windows, were kept open for fresh air. The night was dark, cloudy, and damp, and about six it began to rain. I remained in the room until then without sitting or leaving it, when, there being a vacant chair which some one left at the foot of the bed, I occupied it for nearly two hours, listening to the heavy groans, and witnessing the wasting life of the good and great man who was expiring before me. each group stepped forward as I passed, to inquire into the condition of the President, and to ask if there was no hope. Intense grief was on every countenance when I replied that the President could survive but a short time. The colored people especially — and there were at this time more of them, perhaps, than of whites — were overwhelmed with grief. Returning to the house, I seated myself in the back parlor, where the Attorney-General and others had been engaged in taking evidence concerning the assassination. Stanton, and Speed, and Usher were there, the latter asleep on the bed. There were three or four others also in the room. While I did not feel inclined to sleep, as many did, I was somewhat indisposed. I had been so for several days. The excitement and bad atmosphere from the crowded rooms oppressed me physically. A little before seven, I went into the room where the dying President was rapidly drawing near the closing moments. His wife soon after made her last visit to him. The death-struggle had begun. Robert, his son, stood with several others at the head of the bed. He bore himself well, but on two occasions gave way to overpowering grief and sobbed aloud, turning his head and leaning on the shoulder of Senator Sumner. The respiration of the President became suspended at intervals, and at last entirely ceased at twenty-two minutes past seven. A prayer followed from Dr. Gurley; and the Cabinet, with the exception of Mr. Seward and Mr. McCulloch, immediately thereafter assembled in the back parlor, from which all other persons were excluded, and there signed a letter which was prepared by Attorney-General Speed to the Vice-President, informing him of the event, and that the government devolved upon him. Thanks to: Diary of Gideon Welles, secretary of the navy under Lincoln and Johnson.